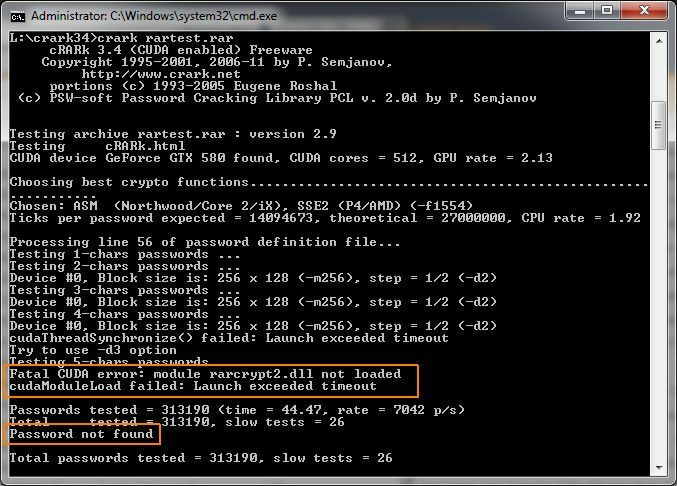 cRARk is a free password cracker (or recovery tool ;)) for RAR archives. One interesting feature is the support of OpenCL for accelerating the cracking (for AMD Radeon and NVIDIA GeForce cards). CUDA is also supported for NVIDIA cards. cRARk is a command line tool and is very easy to use. If the password is not too long (less than 6 characters) you have many chances to find it with cRARk. On a Radeon HD 6970 (with Catalyst 11.10 Preview 3), on the other hand, the OpenCL version of cRARk worked perfectly fine! Then I cracked my simple test file in 39 seconds. To find the password toto, cRARk has tested 411489 passwords at the rate of 10438 passwords / second. The time to find the password was a bit longer (1min 37sec) but the tool did it! This test confirms that AMD Radeon cards are still the hardware of choice for crackers (see this article: Radeon HD 5970: the Ultimate Password Cracking Hardware?)! Where can you find cRARk? 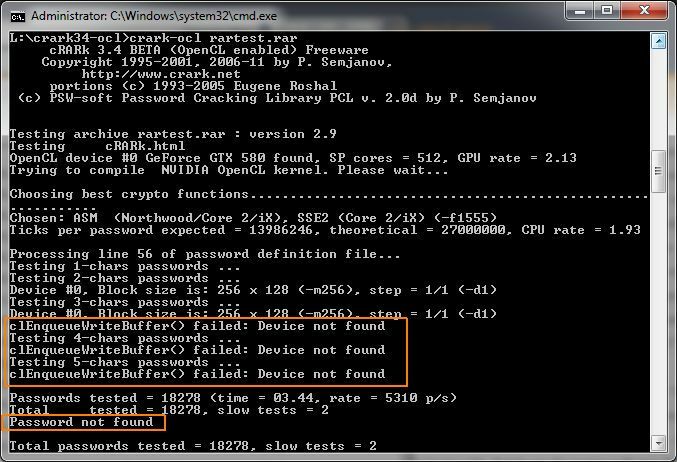 Really simple, just visit this page: cRARk: Fastest utility to crack RAR password. Radeon HD 5970: the Ultimate Password Cracking Hardware? Added at the end of every post! With my 450 it works with CUDA but takes to much time for 6 characters and even if my password is of 4 chars like ‘q2w1’, its starts testing for password length 5!!. Isn’t this some kinda bug? Psolord: heres an article discussing wifi cracking on gpus, theres some tables that show how much longer 2 extra characters will take..
uh, no sorry, if yu need to adjust the tdr timeout config then the application is just fucked. Do not know why it’s asking for “password.def” and this file isn’t present in the directory. Victor: you have to rename the english.def file in password.def.